Malmaison London is tucked away in the heart of the City, set back on Charterhouse Square, which is one of those rare green havens tucked away where you least expect them in the city. The Mal is set into a row of grand, terraced houses, and upon walking into reception, a spiral staircase to the right leads guests down to a lower ground floor dining room. In the brasserie, the pure white tablecloths provide stark contrast to the dark wood and muted lighting, though ground level skylights let in a significant amount of light. My dining companion and I dined alone for the whole service, maybe this was understandable, as lunch was taken in the middle of the weirdness marking the #londonriots, and few were clearly feeling in the mood to eat out. The Mal Burger, a 1/2lb-ish bacon cheeseburger with chips - £13.95. Excellent. 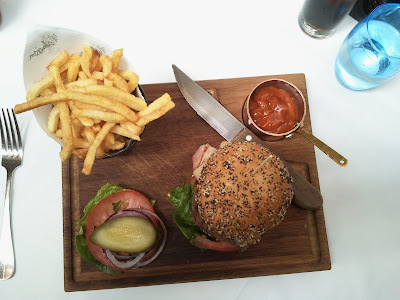 The Mal Burger is presented on a wooden board, complete with a Mal branded pot of french fries, a salad garnish, mini copper saucepan containing a homemade burger relish, and a giant steak knife. The burger itself was stacked high with the ubiquitous wooden stick stabbed through its heart holding the delicious looking package together. Ok. Topped with several rashers of bacon, and a slice of medium cheddar, these complemented the burger well, without having much standout quality in their own right. The cheese wasn't melted in a meaningful way, and very much sat as a separate element, which made it feel like a distant relative, rather than part of a close family unit. The bacon was meaty, but somewhat lacking in flavour. 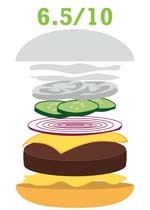 Underneath the patty sat a line of pickles, tomato, lettuce and relish, which enhance the whole combination by adding a sharp, vinegary taste that cut through the rest of the slightly bland ingredients. Not good. The meat in the patty should have ticked all the boxes: coarse grind - check, handmade - check, provenance - check (the meat supplied by Donald Russell in Aberdeenshire, grass-fed, aged etc. ), so why wasn't it great?! There were two reasons for this; the patty was a) over-cooked (i.e. 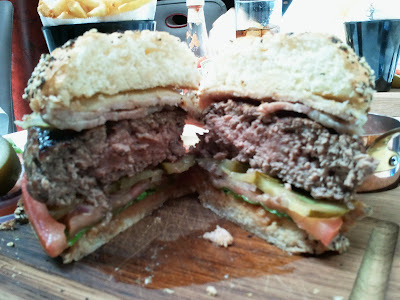 a classic British cooked medium-rare), with only a touch of pink showing, but mostly the uniform grey of a nuked patty; and b) the meat didn't appear to be seasoned, at all. Both factors conspired to deliver a very unappetizing meat experience. The one ray of light was it wasn't dry (despite the pictures looking to the contrary), it was actually quite juicy, but certainly didn't have me close to throwing an air punch and yelling "meat win!" in ecstatic joy - you may laugh, but that has happened. Ok. This bun was a poppy and sesame seeded bap. I am very open to bun experimentation, as long as the combination with patty and toppings works. The crime this bun committed however, was that it was too dry, to the extent that it appeared to be day-old rather than fresh-this-morning, this in turn meant there was no way the burger and stack of accompanying toppings would hold together when faced with the attentions of an eager pair of hands, and a hungry burger blogger. Luckily, shortly after we finished, our waitress bounded over with a table scraper to tidy up the devastation. Faultless. The Mal branded, black pot of french fries looked slick, and the fries were cooked to perfection. The salad garnish included a wedge of pickle, riding an onion/tomato/lettuce horse. And the homemade burger relish was delish. A reduction, I guess, that was more in the way of a concasse than relish, but worked really with slathered over fries and burger alike! 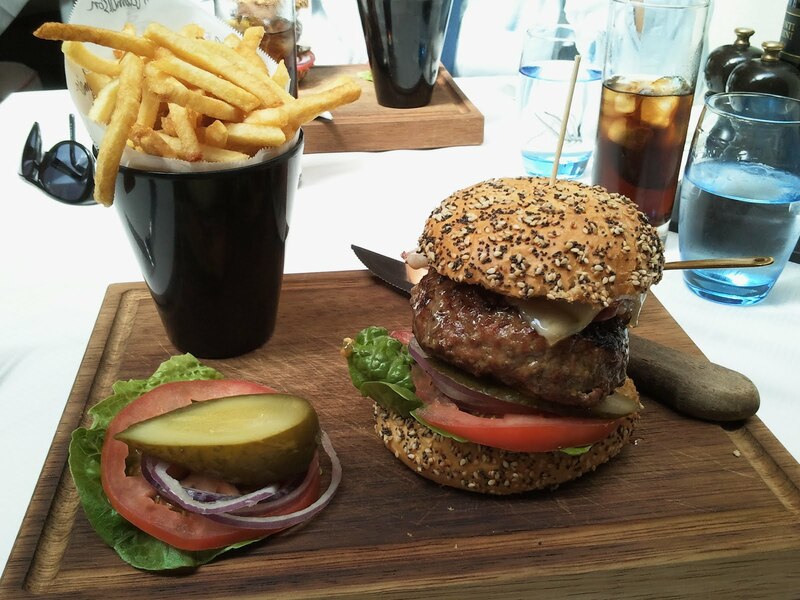 The Malmaison London Brasserie is an achingly cool venue for lunch, and you would earn some serious brownie points if you took your other half to dine here, as for me it oozes smart. However, I expected so much more from their signature burger, especially given the emphasis placed on ingredient sourcing, and Mal's otherwise impeccable attention to detail. 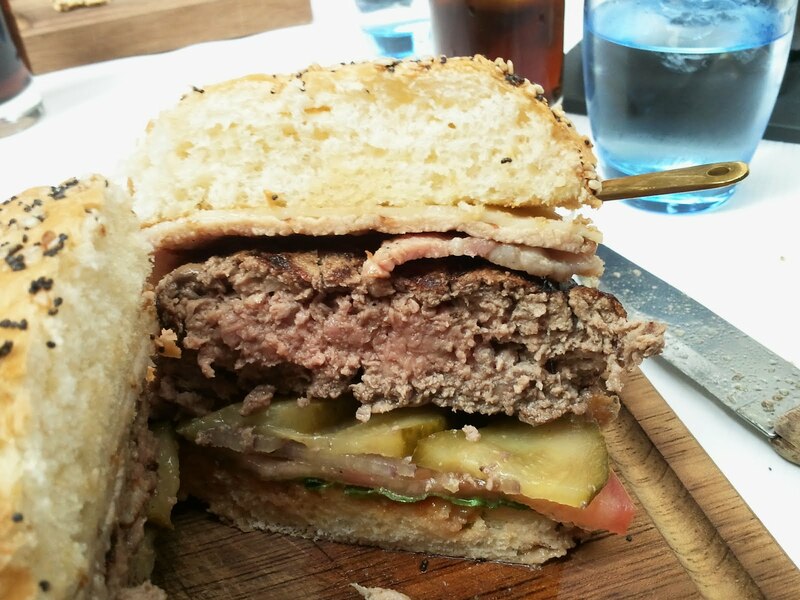 For £14, there are much more flavoursome and much better burgers to be had in London.